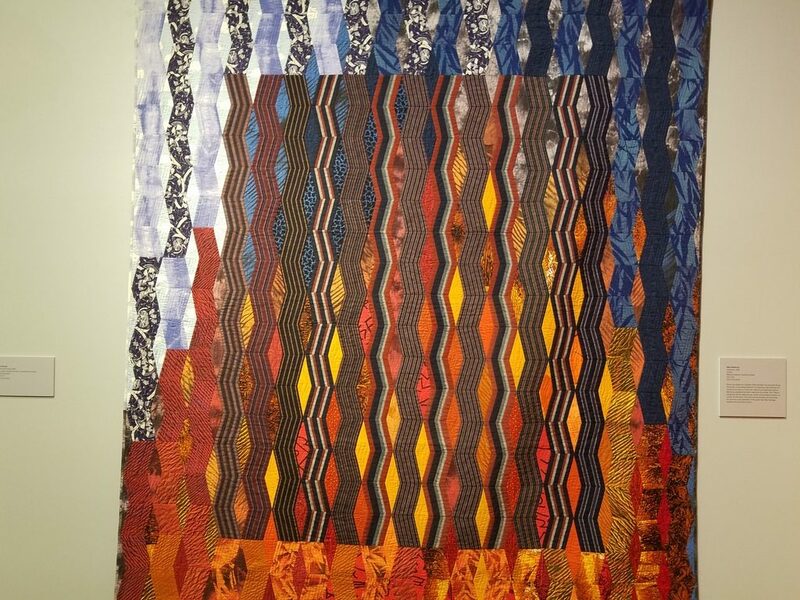 For Inspiration Visit a Quilt Museum! Every now and then I enjoy taking a break from my own work to look at art created by other people. 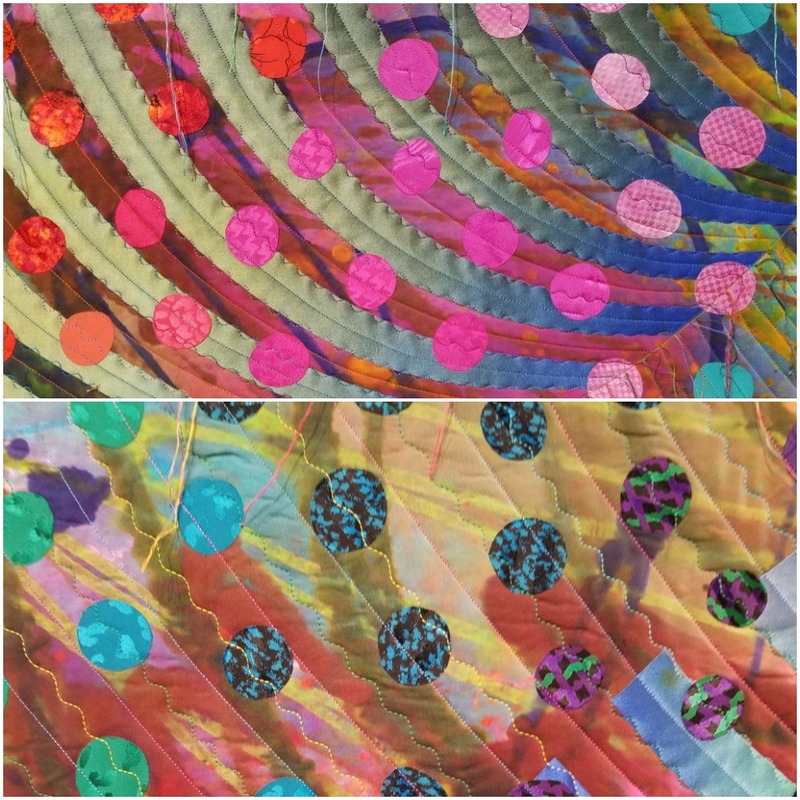 Seeing what other textile artists make is inspiring, and often has the effect of getting my own creative juices flowing. I like looking at pictures of art on the web, but nothing beats seeing real, physical pieces up close. 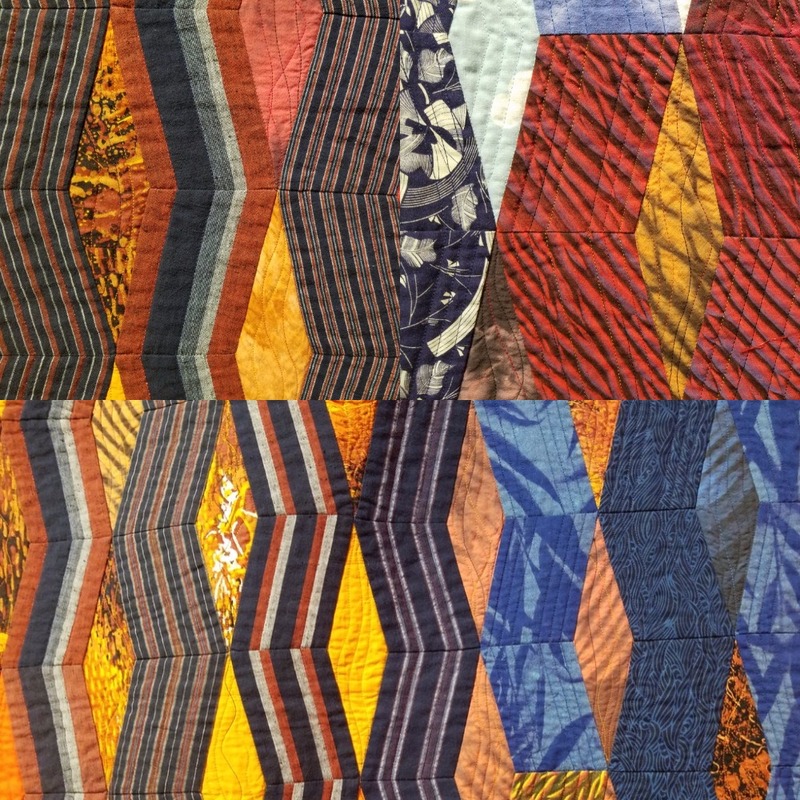 This week I felt like I needed to spark my motivation, and so went to visit the San Jose Museum of Quilts and Textiles. 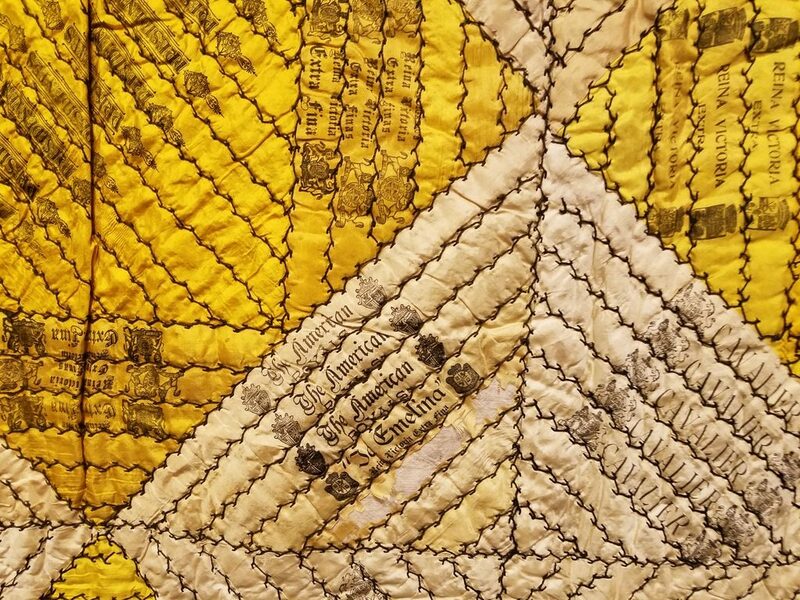 The museum currently holds a 40th anniversary exhibition, and displays a selection of quilts from its permanent collection. These include both old quilts and contemporary ones, though at first glimpse it’s sometimes hard to tell which is which. It’s composition, a combination of log cabin and square-in-a-square blocks, is traditional. But it’s bright colors and dark, brand-name prints have a contemporary air to them. The quilt, it turned out, was made in 1900, from silk cigar wraps. The cigars were smoked by men, but the silk casings were collected and traded among women. A woman also sewed and hand-quilted the entire piece. This quilt thus embodies the traditional social roles of men and women. Men smoked for recreation. Women sewed. 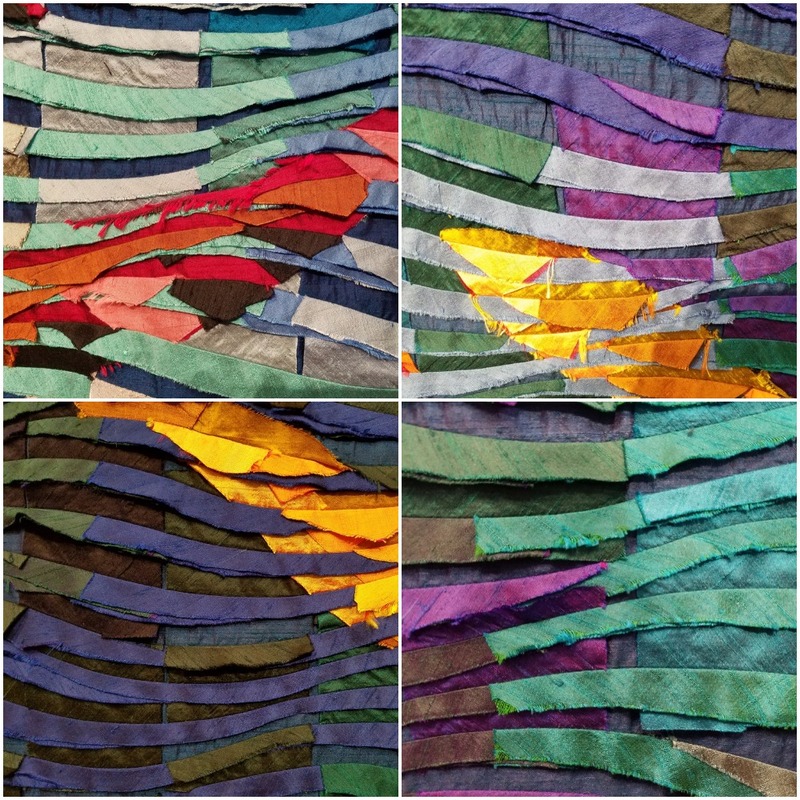 The quilt reminded me of the origins of the art: quilting, after all, was born out of frugality, necessity, poverty. All these values remain relevant, except, perhaps, for the poverty aspect. Today, we have different names for the same ideas. We call them up-cycling, eco-friendliness, sustainability. Many of us, myself included, choose to pursue them out of principal, guided by concern for the health of our planet. We choose to use rescued fabrics because we believe this is the right thing to do, not because we can’t afford new textiles. Another piece that caught my eye was Firestorm by Mary Mashuta. 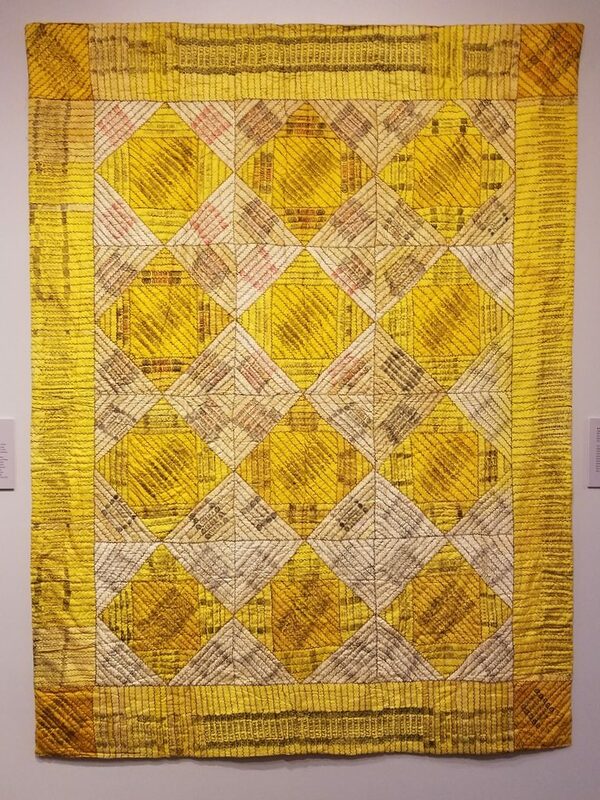 Mashuta finished this quilt in 1992 to commemorate the East Bay Fire of 1991. It hit a raw nerve in me because just a few weeks ago my entire city was engulfed, for days, by the smell of smoke coming from the devastating Marin County fires, which destroyed over 1,500 homes some 150 miles away. 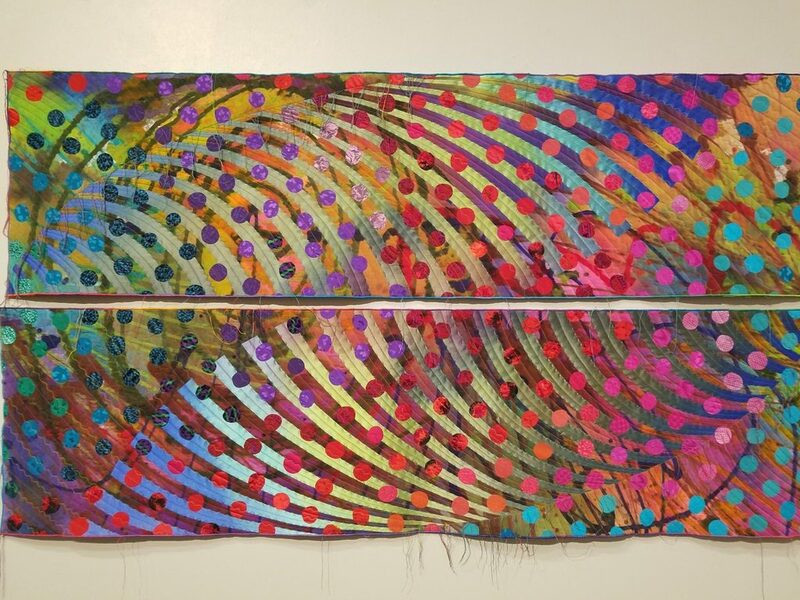 I liked what Banner did with the different colors, but also how she played with different patterns and different stitches. Even the threads she left hanging add to the visual interest. Else made this sculpture from cotton sewn over plastic skeletons. It depicts parents and a young child posed in a loving family moment. There is something very touching in the way the parents and the child embrace each other, and in their jaws that appear to be smiling. The colors, too, are warm and happy. 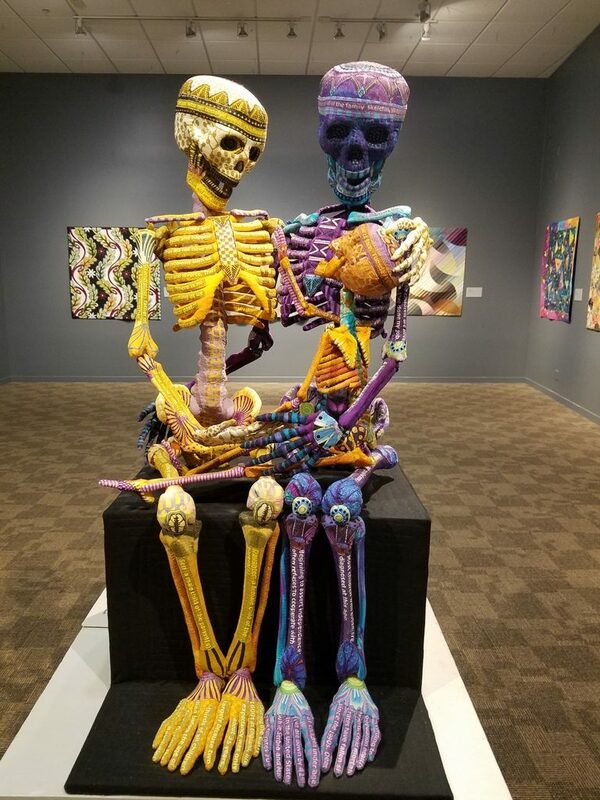 Yet, there is something very disturbing in the fact that these are skeletons. A dead family. 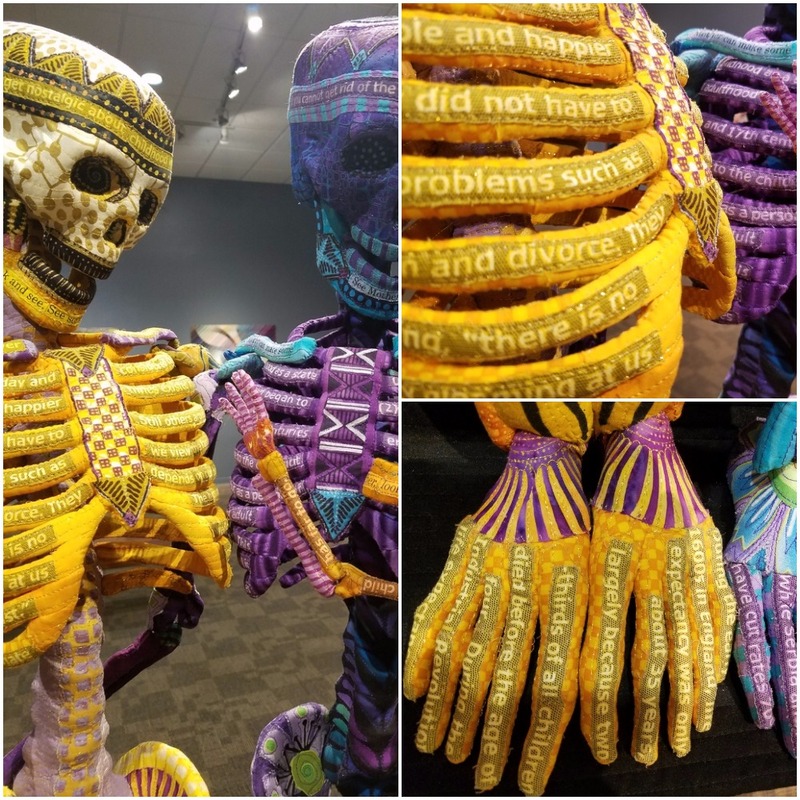 The skeletons are covered in text, describing aspects of family life, childhood, as well as a historical discussion of child mortality. A part of a series, this subculture reminds us of the joys of family life, and it’s uncertainties. In a way, it is every parent’s deepest fears incarnate. As a parent, it’s impossible to look and this piece and remain indifferent. There were other interesting quilts in the exhibition, so if you’re in the Bay Area, I encourage you to go check the museum out yourself. 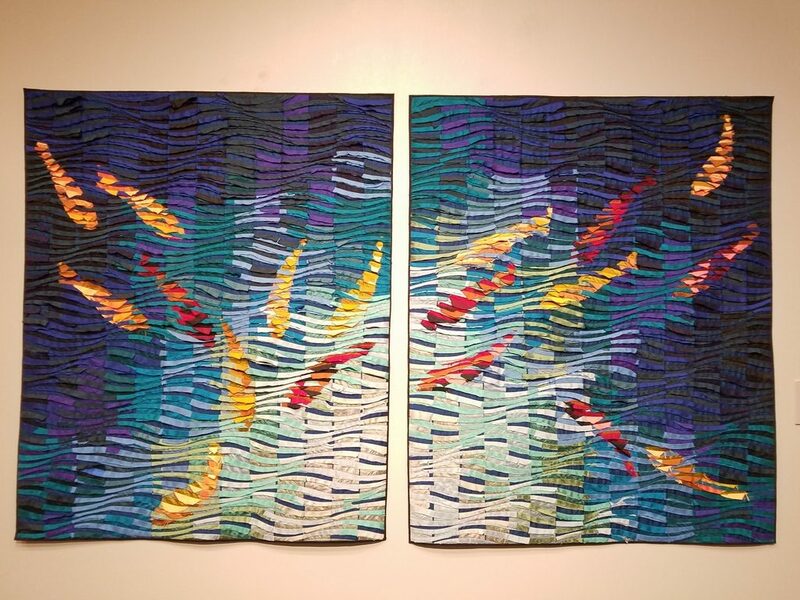 This entry was posted in Textile Art and tagged musems, San Jose, textile art, travel by ANY Texture. Bookmark the permalink.